The Canon CA-PS400 Compact Power Charger for Two BP-500 series Battery Packs is designed to take full advantage of high capacity rechargeable batteries. 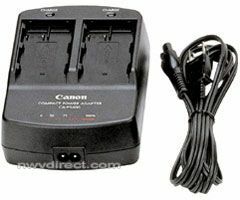 It has been specially designed to charge the Canon BP-511, 511A, 512, 514, 522 & 535 Batteries. Note: The Charger will only charge one battery at a time.